Which mobile tools do pupils really use? I was researching ‘Pupil perspectives on mobile learning’ and worked with two schools – one where all pupils had a mobile device supplied by the school Academy M) and a second where mobile devices were not allowed (Academy A). I asked all pupils whether they used mobile devices to help with their learning. From those who replied ‘yes’, I went on to ask them (via a questionnaire) which features of their mobile devices they used to support their learning. The Internet was the most widely used tool. When asked about this, the most frequent response was that it was used for ‘research’. For most pupils, this meant that they would ‘google’ something and then read the results. However, there was little understanding of how to verify any findings or examine sources. The Internet was also used to access resources such as ‘You Tube’, the school ‘VLE’ (Virtual Learning Environment) and even email (via webmail), so it is difficult to classify as it serves many purposes. The camera was used to take photographs of classroom activities (such as Science experiments), the board (when the teacher had written things that the pupils did not have time to copy down or when their homework was written on it), items outside the classroom that the pupils wanted to use in school projects, and photographs or videos of other pupils when they were learning (e.g. drama / sport). Email was used to communicate with other pupils and with teachers. Pupils at the Mobile Academy communicated regularly with their teachers and often outside school hours. Teachers said that this had helped them to build relationships with the pupils and pupils said that it supported their homework. You Tube / Videos: Many of the pupils surveyed and subsequently interviewed talked about how they use video for learning – some to the exclusion of reading or because they find reading hard. You Tube would often be the first port of call in researching a new topic, ahead of reading or searching the internet for text-based articles. Apps: Pupils actually found it hard to define an ‘app’. For them, everything on their mobile devices was an ‘app’, whether it was the email app, the you tube app, the browser app or a specific learning app. Subject-specific learning apps did not feature heavily in the things used by pupils to help learning. They could all name generic apps, such as Keynote, Safari and Pages, but no one was able to give me the name of an app that had helped them to learn something in a subject area. VLE / iTunesU: The focus here was on structures that the schools used to support learning. iTUnesU was quite heavily used by pupils at Academy M as their lessons and homework were structured around iTUnesU files. The VLE at the other school (Academy A) was not specifically promoted for use on mobile devices. Alarm Clock: Most pupils used their devices as alarm clocks. Most did not have another alarm. This tells us 2 things – 1) they have their devices in their bedrooms overnight and 2) they use the devices for organisational purposes. E-reader: Pupils at Academy M were doing a lot of their reading on their devices. They were encouraged to use iBooks and many found the search facilities available in e-books enhanced their ability to study a text. This had not been explicitly discussed at Academy A and pupils were not, in general, making use of their own devices for reading. Calendar: Most pupils only use their mobile devices as a calendar, with few maintaining a paper diary. One pupil said that he did all his organising on it and the fact that he was not allowed to use it in school was ‘weird’. Podcasts: Used by pupils at Academy M but little used by those at Academy A. Pupils do enjoy making their own and sharing with friends rather than using commercial ones, although they will search for and download podcasts that are directly relevant to their schoolwork. Text Messages: Pupils love to text and using either their phones or iMessage, they are regularly in contact by text, and not just about social things – they are also using it to organise learning events with their peers. Checking on homework, arranging to meet to work together or asking questions are a normal part of pupils’ lives. 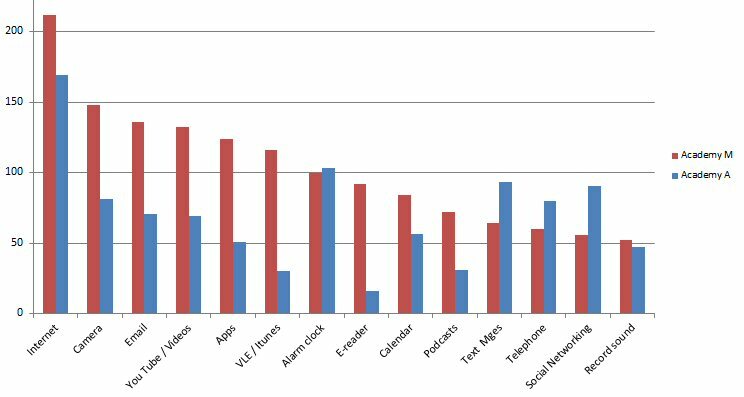 Telephone: Most of the pupils at Academy A were using devices which were their mobile phones. They used them for phone calls, but also creatively, making use of Skype or Facetime to share homework that they could show whilst discussing it. Pupils at Academy M did not have a phone facility on their devices and also did not contact each other much in the evenings. This was probably cultural rather than related to the devices. Social Networking: Again, a divide between the schools. Pupils at Academy A used a lot of social networking. They also experienced more problems with bullying. However, they did also use the social networks constructively for learning. Pupils at Academy M did not have a culture of social networking and tended to stick to email for communication with peers. Record sound: The ability to record sound was a features that pupils were using for music and language-learning. Although not used widely, it was mentioned by pupils at both schools. Pupils were keen on the idea of creating their own content. What is striking is the diversity of activities, which can be carried out using a single device. Not even 5 years ago, we would have had to carry or use several devices to carry out the same tasks. Whilst this provides a fantastic opportunity for learning activities, it also carries with it the risk of distraction. This research only looked at learning, so I have not adding ‘social games’ onto the chart. Overall, when asked, 70% of pupils at BOTH schools felt that using mobile devices in the classroom would be beneficial. The 30% who did not think it would be a good idea said that the devices would be distracting and would not help them to learn. Would you have let someone teach you to drive who had never learned to drive themselves? Would you have followed a recipe with just the ingredients but no instructions on how they were best combined and cooked? I’ve been looking into mobile and handheld learning seriously for the last year. Most of the literature to date focuses on Higher Education (the University sector) and much of the discussion is about how students can access course materials and build learning networks. However, I work in an organisation which works with schools – primary through to 18-year olds. The discussion is really starting to get going in this area and through the work and conversations I have had with schools, there is a great deal of interest in pupils using mobile devices in the classroom. However, there are some serious hurdles to overcome and I had a ‘Road to Damascus’ moment last week. Whatever the problems in schools with infrastructure, wifi, e-safety, financing devies and so on may be, there is one big bridge to cross: the teachers need to be engaged and if the teachers are to be engaged, they need to have a proper understanding not just of what it means to facilitate m-learning for their pupils, but what it means to be an m-learner. In the last year, my Masters in E-learning with the University of Huddersfield has given me a real flavour of what being an m-learner can feel like. I’ve had to blog (and now even enjoy it! ), taken part in and eventually ran a webinar, kept in contact with course participants through social networking (or professional networking as I prefer to call it). m-learning has meant that I am learning literally ‘any time, any place, any where’ – and I’ve loved it. With this in mind, I’ve written a course called Twitter for Teachers (a name unashamedly pinched from the lovely video about Personal Learning Networks by @PB_H ) which will aim to activate a form of m-learning. I suspect that quite a few teachers are already using Twitter and other social networks but I hope this course will open up the possibility to a greater number of teachers, especially if they are supported whilst they do it. The course itself is just a starting point. 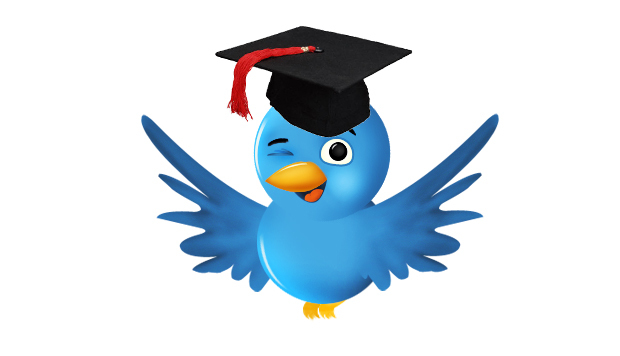 Once a person starts to receive tweets, they form a springboard to many other m-learning opportunities. Sharing good classroom practice, keeping up with subject associations, exam boards, academics, governments – the sort of thing that it is hard, nay impossible, to do in face-to-face contact time. The learning may be informal, unstructured and ‘chaotic’, but it can begin to give a flavour of what m-learning can feel like. (Of course, a teacher may choose to do it all at a computer, not using mobile devices and not being geographically mobile, but the connectedness is rapidly becoming a part of the m-learning culture.) Twitter is just a small part of what can be termed m-learning, but its a stepping stone and one which I hope will lead to us taking to the waters of the river beneath. (See imagery from the video mentioned above). The concept of ‘tweeting teachers’ is not new – teachers have tweeted since Twitter was invented – but the networks are now building and becoming increasingly useful. We have moved beyond early adopters and into the mainstream. A new word has emerged: a tweacher (a teacher who uses Twitter) and I know of a group of MFL teachers who tweet regularly who have become the MFL Twitterati. In her article on the use of m-learning in Teacher Training in 2009, Jocelyn Wishart found mixed results about the way that trainee teachers became m-learners. This will almost certainly be true on this course as well, but it will be interesting to see how many teachers take to it and what impact this has on their work. I am really looking forward to working alongside our teachers to see if they enjoy the course and what benefits the networking may bring. Which apps should I buy? So, back to the ‘app’ question. Which apps should you buy? Well, what are you teaching? What are the pupils learning? Is an app the cover-all pill that a pupil can take to digest this chunk of learning? Will you be using the app for the whole class or is this something that the pupils will use on their own / in groups? …. I don’t want to knock apps completely – there are some very good ones, some which pupils enjoy and no doubt will learn from effectively, but until we have a clear idea about what we are teaching and what pupils are learning and how, buying an app as a sticking plaster isn’t going to work. Both very useful, adding some substance to the ‘Which app?’ debate. Secondary schools are taking a keen interest in the use of mobile technologies as pilot studies have indicated that there may be ‘considerable pedagogic potential’ (Kukulska-Hulme & Traxler, 2007, p. 181). Indeed, a term that has emerged in the last couple of years is BYOD (Bring Your Own Device), defined as ‘bringing [one’s] own mobile devices… into the workplace for use and connectivity’ (Webopedia, 2011) Increasingly, schools are realising that the technology held in their pupils’ hands can be of benefit rather than being disruptive. Some schools are encouraging and even supplying the technology. But why? The reason must lay with the functionality of these devices. ‘These technologies offer unique possibilities to design for learning that are unlike any afforded by other e-learning technologies’ explain Kukulska-Hulme and Traxler (2007, p.183) They go on to say that they are capable of supporting designs for learning which are ‘personalized, situated and authentic’. Let us explore these further. Learning that is personalised ‘delivers learning to each learner when and where they want it’ (p.184). There may be a misconception that learning with mobile devices is about learning on the move but the more important understanding is that the device is with the learner – whilst in the classroom, on the bus or at home. It is fully accessible at all times, with the content that the learner wants to use. Learning that is ‘situated’ delivers learning in a context that is directly relevant to the learner. There are some very useful applications in the Secondary school. Pupils can collect data and information from outside the classroom. For example, pupils can video and replay action for Sport, collect digital photos of realia for Art, record real interviews from people for History or English. This leads neatly to the third area which is that learning should be ‘authentic’, that it ‘involves real-world problems and projects that are relevant and interesting to the learner’. (Kukulska-Hulme & Traxler, 2007, p. 185) School can seem to be removed from the real world but the increasing connection pupils can have with the outside world through mobile devices can bring a validity to work which may otherwise seem dry and irrelevant. In researching this piece of work, I have realised the full scope of what will become a revolution in the way we teach and learn. Whilst predicting the future is rarely possible, it is almost certain that learners will make increasing use of mobile technologies and, ‘in the future, the success of learning and teaching with mobile technologies will be measured by how seamlessly it weaves itself into our daily lives, with the greatest success paradoxically occurring at the point where we don’t recognise it as learning at all.’ (Futurelab, 2004). Futurelab. (2004). Report 11: Literature Review in Mobile Technologies and Learning. Birmingham: Futurelab. Kukulska-Hulme, A., & Traxler, J. (2007). Designing for Mobile and Wireless Learning. In H. Beetham, & R. Sharpe, Rethinking Pedagogy for a Digital Age (pp. 180-192). Abingdon, Oxon: Routledge.